Jake was a great Alpine goat that came from a large goat farm. He loved to play “headbutt” with the kids and adults. He would stand tall on two legs and pretend he was going to ram you. But he was very gentle and loving and full of fun. Many residential children knew Jake. We miss your exotic looks and your fun spirit, Jake. Please consider making a tax deductible donation. TGMR is a non-profit organization with 501c(3) status. New! Sunshine's Duck Eggs - $5/dozen. 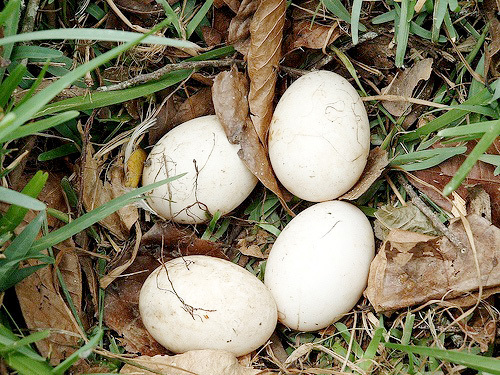 Call for fresh duck eggs at TGMR at 610-398-2122. Like you, we're passionate about helping Gress Mountain Ranch. We've created new Goodsurveys to help you earn donations simply by sharing your opinion -- so now's the time to get started! Simply choose from rotating Fortune 500 market research surveys and earn about $1 for each one you complete. Don't miss out on this simple way to make a difference! We Need Volunteers for Ranch Maintenance and Fundraising Events! The Gress Mountain Ranch is 100% volunteer run and 100% funded by your donations! Fundraising is essential to the survival of the ranch. We always need volunteers for help at the ranch and fundraising events such as parades and fairs. Please help the animals who help people by donating or volunteering today. CONTACT US if you can help. TGMR has been busy with Eagle Scout projects and science fair projects this year. CLICK HERE to read about some amazing kids doing amazing work!